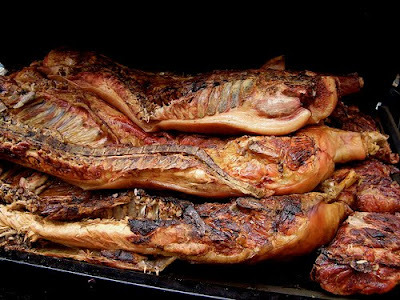 To prepare a whole pig you require a BBQ smoker-pit big enough to cook it. Smoke with hickory and oak woods. Start by purchasing a quality grade whole pig from a reliable butcher. You will be looking for a pig 60 to 100 pounds. Ask for the pig to be butterflied so it can laid out relatively flat in the smoker or have the pig cut in half. Leave the skin on one side and ask for the inside to be cleaned and trimmed of silver skin and fat. If you can refrigerate a whole hog get it a day or two in advance, season it with a good rub and let marinate in the refrigerator until your ready to smoke. * Trim the inside of your pig. * Remove loose ends, skin, bone, fat. * Rub the pig with vinegar & cloth to clean. * Inject your pig with a liquid marinade. * Rub with yellow mustard on meat side. * Rub with kosher salt on skin side. * Season pig on the meat side with fresh spices (rub). * Cook for 10 hours at 220-240 degrees F.
* Reach internal temperature of 175 degrees F.
* Cook skin side up for 4-8 hours and then flip. * Cook an additional 1-2 hours and turn again. * Finish cooking skin side up. * Use a mop to baste the hog every hour. * Apply whatever sauce you want at the end. Once the pig is cooked remove it from the smoker and let it sit for about an hour, wrapped up tightly. This will let it cool down a bit, but also let the heat even out and the juices flow back into the meat. Now you are ready to start pulling the meat. The meat should pull freely from the bones. 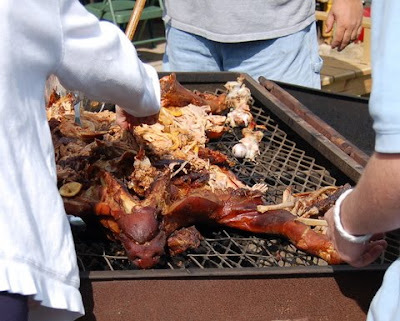 You should start by cutting or breaking the pig up into large pieces about 5 to 10 pounds each. From these large sections shred the meat into small pieces or strips. You do not want to crush the meat, but gently pull it apart. A good pair of insulative, latex cooking gloves are a must. You will want to put the shredded meat into a large pot to keep warm and to mix up. A perfect pile of pulled pork should have meat from every part of the pig. Add spices and apple cider based vinegar sauce to taste for classic Carolina Pulled Pork. Mix together and store in and airtight container. May be stored for several months in a cool dark place. How-To-BBQ - Watch videos on how to prepare meat & BBQ recipes. BBQ Restaurant Tour - Watch video tours of BBQ Restaurants across North America.